What is a soundfont ? 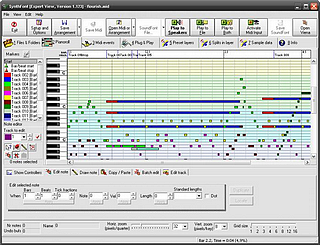 A soundfont bank contains base samples in PCM format (similar to WAV files) that are mapped to sections on a musical keyboard. A soundfont bank also contains other music synthesis parameters such as loops, vibrato effect, and velocity sensitive volume changing. With these capabilities, a computer with a soundfont-compatible sound card or synthesizer can render audio content that is similar in quality to that of a professional digital sampler. How to install a VSTi soundfont player ? There are simple and good tutorials here and there. - For VSTi plugins, check here, or download directly the Pack of free soundfont players made by Jikoo. - For Mac users, check here. - For standalone players on Windows, check here. There are lot of commercial soundfont players (Windows and Mac). Download directly all free soundfonts in SF2 or SfArk (Compressed SF2) format. Blitz Lunar Secret of Mana . Blitz Lunar Super Bomberman . Blitz Lunar Zelda 3 . Thank you to Blitz Lunar (aka Dave Harris) for his great help.